Madison Manor is a thriving Arlington neighborhood that combines quiet residential streets, parkland, and a neighborhood elementary school with easy access to nearby large commercial districts, public rail transportation, and the regional highway network. Located near to Arlington’s western tip, it is bounded by McKinley Road, Rt. 66 and the Four Mile Run and the Washington & Old Dominion (W&OD)/Four Mile Run multi-purpose trail, Roosevelt Street, and the Arlington County line. The neighborhood takes its name from a subdivision that was begun during World War II and grew steadily over the next three decades. The mix of architectural styles mirrors the history of Arlington’s post-World War II real estate boom: walking through the neighborhood from east to west, one first encounters brick colonials and Cape Cods, then split-levels with garages, and finally airy wooden contemporaries with car ports, balconies and sliding glass doors. A small enclave of town homes built during the 1970s and known as Sycamore Ridge completes the neighborhood. 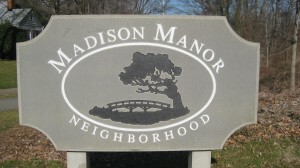 See what the Washington Post had to say about Madison Manor!